Book by Marsha Norman, based on The Secret Garden by Frances Hodgson Burnett. Music by Lucy Simon. Lyrics by Marsha Norman. The original Broadway production opened on 25 April 1991 and was directed by Susan H. Schulman, with choreography by Michael Lichtefeld. The production closed on 3 January 1993, running for a total of 709 performances. India, 1911. A great cholera epidemic has hit an English compound in Bombay. Mary Lennox, a young girl, awakens to discover that her mother, father and all the rest of the people she knows in the compound have succumbed to the horrible disease (OPENING DREAM / THERE’S A GIRL). With no place to go she is sent to live with her hunchbacked Uncle Archibald at Misselthwaite mansion in Yorkshire, England. Mrs. Medlock, the housekeeper from Misselthwaite, meets the young girl at the train station to bring her to the mansion and tells her that her Uncle has been in deep mourning over the death of his wife, Lily for the past 10 years. She tells Mary that she should not expect to see her uncle much, that there will be no one to play with and that she is forbidden to wander the halls (THE HOUSE UPON THE HILL). During her first night in the gloomy, miserable mansion, Mary hears an eerie wailing. Trying to find the source of the sound, she sees nothing but the shadows of her brooding Uncle as he wanders the halls (I HEARD SOMEONE CRYING). The following morning, Mary meets Martha, the young chambermaid. Martha tries to lift Mary’s spirits by telling her that there might be some interesting diversions to the gloomy mansion if she went outside (A FINE WHITE HORSE). Mary remains unconvinced but decides to venture outdoors anyway. On her way she discovers her Uncle in an empty ballroom, seemingly lost and dancing with the ghost of his dead wife (A GIRL IN THE VALLEY). Mary’s spirits begin to lift after spending some of her days outside. She meets the grouchy gardener, Ben (IT’S A MAZE), who tells her of a mysterious garden surrounded by walls, which once belonged to her aunt Lily and has been locked since her death. Mary is determined to find this secret garden and discover its contents. She meets Dickon, Martha’s brother, who is busy conjuring up the spring (WINTER’S ON THE WING). Mary enlists the help of young Dickon to help her learn Yorkshire so that she may speak to the ever-chirping robin, in hopes that the bird might help Mary find the key to the garden (SHOW ME THE KEY). The bird does in fact lead Mary to the key, but she cannot find the door to the garden. Having not found the door, Mary asks her Uncle if she might have a bit of earth to plant the penny’s worth of seeds that Dickon has given her. The request seems to unlock powerful memories in Archibald (A BIT OF EARTH). His memories are also triggered by the likeness that Mary shares with his Lily. The emotional STORM (I) that is being stirred up is reflected in the landscape of the moors.Archibald’s brother, Neville, who was secretly in love with Lily, also notices the resemblance (LILY’S EYES). As the STORM (II) continues, Mary – hearing the wailing again that night – ventures to a wing of the house that she is forbidden to enter. There she finds her sickly, bedridden cousin, Colin. Colin never sees his father because, on Neville’s advice, Archibald only visits his sick son when he is asleep (ROUND-SHOULDERED MAN). Discovered in Colin’s room by an angry Mrs. Medlock and Neville, Mary is banished from the room and runs out into the storm where the sprits of her parents and friends in India lead her to the ivy covered door of the secret garden (FINAL STORM). Mary dreams of the garden and the happiness it will bring her: all of the people she has loved in her life are alive and well and celebrating her birthday in the lovely garden (THE GIRL I MEAN TO BE). Inside the mansion, Archibald is preparing to leave for Paris. Neville confronts Archibald about shirking his responsibilities and insists that Mary is disturbing Colin and must be sent away (QUARTET). Archibald will not change his mind and visits his sleeping son to say good-bye (RACE YOU TO THE TOP OF THE MORNING). He then leaves for Paris. Mary confides in Dickon that she has found the garden but that it is the “most forgotten place” she has ever seen. All the plants and trees are dead. Dickon explains that even though some things look dead, deep inside they are still alive (WICK) and they agree to work together to bring the garden back to life. Mary tells Colin she has found his mother’s garden and she thinks he should go with her to see it with her. He is fearful of going outside, but the spirit of his mother gives him the courage to go (COME TO MY GARDEN). Once Colin enters the garden, its magical powers help him overcome his fear and enable him to stand and walk (COME SPIRIT, COME CHARM). Neville is intent upon finding a boarding school to send Mary away to (DISAPPEAR), but Mary sees that the work she and Colin are doing in the garden is making the garden come alive and helping Colin regain his strength. She refuses to go and is encouraged to continue helping Colin by Martha (HOLD ON). Martha also helps Mary write a letter to her Uncle in Paris to ask him to come home (LETTER SONG). When the letter reaches Archibald in Paris he is in deep despair (WHERE IN THE WORLD?). The spirit of his beautiful wife, Lily, comes back to comfort him and ask for his forgiveness for leaving him so early in their lives together (HOW COULD I EVER KNOW?). Her comforting encourages Archibald to return home. Upon his arrival, Archibald discovers the secret garden, quite alive and in spectacular bloom, and finds his young son healthy and walking. Archibald thanks Mary for all she has done, welcomes her as his own child and assures her that Misselthwaite will always be her home. In thanks, he also gives Mary the beautiful garden to have as her very own (FINALE). FROM LEFT TO RIGHT: 1. 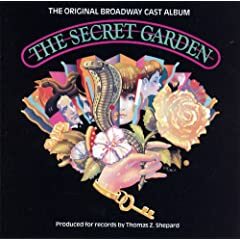 The Secret Garden Original Broadway Cast CD. 2. The Secret Garden Original London Cast CD. 3. The Secret Garden 1975 BBC Film. 4. The Secret Garden 1993 Film DVD Box Set (with A Little Princess). 5. The Secret Garden 2003 Animated Film DVD. FROM LEFT TO RIGHT: 1. The Secret Garden classic children’s book by Frances Hodgeson Burnett.. 2. The Secret Garden book of the musical (the script). 3. The Secret Garden Easy Piano Selections. 4. The Secret Garden Piano Selections. 5. The Secret Garden Vocal Score.